DTC Support – DABC advocates provide direct support by helping people who are eligible for the RDSP to apply for the DTC, a pre-requisite for the RDSP. Help with the RDSP – Plan Institute operates a Disability Planning Helpline (1-844-311-PLAN) – 1:1 support provided by expert advisors, on key future planning and RDSP information. Free Info Sessions – Access RDSP offers RDSP and DTC learning sessions – information for families, healthcare professionals, financial professionals, organizations, and other groups. 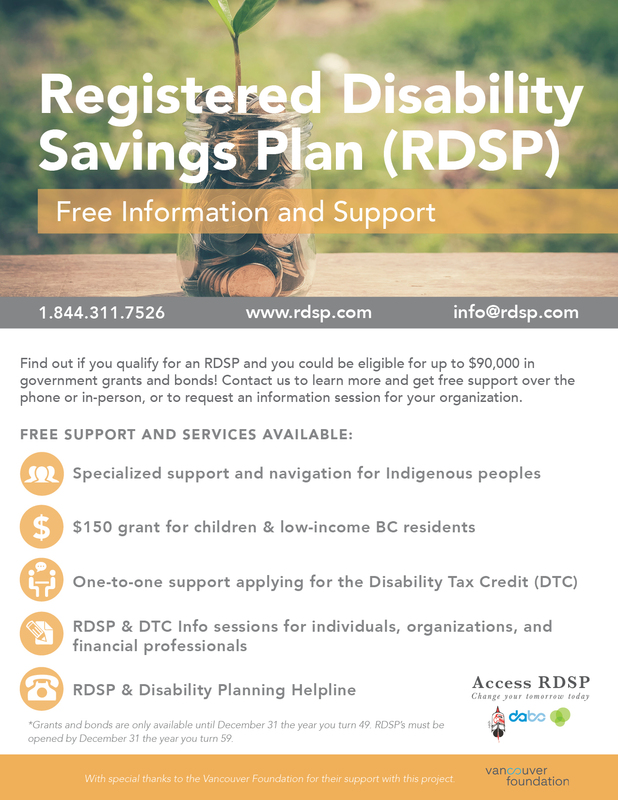 Indigenous RDSP Navigation – If you are an Indigenous person living with a disability, the BCANDS RDSP Navigation program can help you to open an RDSP to assist you in meeting future financial needs. $150 Grant for BC Residents – Plan Institute is administering Endowment 150, a $150 one-time grant aimed at helping individuals and families with low incomes save for the future by jump-starting their RDSP. We are looking to distribute 1000 grants each year – please spread the word! Click the links below to download and share our collateral and logo! Disability Alliance BC (DABC) is a non-profit organization that supports people, with all disabilities, to live with dignity, independence and as equal and full participants in the community. We champion issues impacting the lives of people with disabilities through our direct services, community partnerships, advocacy, research and publications. BC Aboriginal Network on Disability Society (BCANDS) is a non-profit organization which assists Indigenous people who live with a disability, and reside within the province of British Columbia or on-reserve organizations requiring health information, resources and support services.